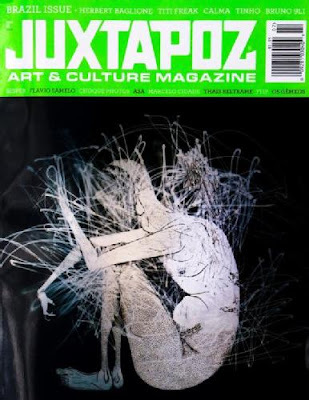 A ultima edicao da revista JUXTAPOZ ja esta a venda e traz ao mundo inteiro a possibilidade de conhecer a producao brasileira de arte underground. Tendo, entre outros, trabalhos e entrevistas de artistas como Tinho, Herbert Baglione, Flip, Thais Beltrame, Flavio Samelo e Sesper, ela traz uma parte do que tem sido produzido nas ruas e ateliers brasileiros. The last one issue from Juxtapoz is already on sale and takes to the world the possibility to meet the brazilian production of underground art. With brazilian artists as Tinho, Herbert Baglione, Flip, Thais Beltrame, Flavio Samelo and Sesper, the magazine shows a bit of that had been produced in the streets and studios by brazilian artists. I met the first Juxtapoz' magazine since the beggining in 1994. When I took it in my hands first time I gone mad. How could exist in that time one magazine with artists as Robert Williams, Big Daddy Roth and Von Dutch in the same issue ? And nothing more than underground art inside ? Unfortunaly I couldn't have this one magazine because it belongs to my friend and I couldn't find another one here in Brazil. My first one Juxtapoz comes to me in 1995, one year later, when my uncle went to Miami and takes to me the Juxtapoz issue 4 with Mark Gonzales and Twist inside..
e nem demora muito... o tempo passa muito rapido qdo vc nao tem tempo de olhar pra ele..
e, se vc estiver mesmo batalhando pra conseguir o que quer, nao tera tempo de ver o tempo passar..